To begin with a confession: I’d never been to the Foundling Museum before this project began. In fact, I only heard of it by coincidence shortly before that. Shame on me: the Museum, and its story, are remarkable facets of the city I love so much. However did I miss them until now? Mind you, perhaps it was good to come to the story afresh. As we were guided around the exhibits for our briefing, the discovery that unwanted babies were once simply abandoned by the London roadsides was as startling as it was heart-wrenching. Instantly, Thomas Coram the individual became more vivid in the mind: one could imagine, albeit in a small way, the shock and horror he must have felt at the sight of these deserted infants. Discovering I’d been assigned the chapel pews raised a smile. As the son of an Anglican clergyman, I spent a good deal of my own childhood seated on one pew or another. At first, I wondered what parallels I might draw from this coincidence. But if Coram’s story is about anything, it’s about looking beyond oneself. Quickly, I ditched any idea of dragging my own story into the sestude. 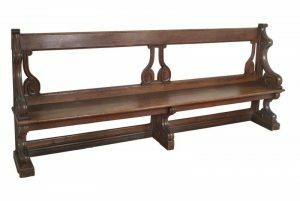 The pews themselves are fairly simple, heavy oak pews. If there was a story to be told about them, I thought, it would likely be about the people who sat in them rather than the objects themselves. People are always the key, after all. So, how fortunate I was to be handed a wonderful insight into those people by Kathryn Wilson at the Museum. Kathryn emailed me a 2011 article by Professor Rosemary Ashton, who runs the UCL’s Bloomsbury Project – an ongoing investigation into ‘Bloomsbury’s development from swampy rubbish-dump to centre of intellectual life’ (to quote their website). The article reveals a canny fundraising venture that began at the Hospital in the 1790s. In those early days of the Chapel’s history, Londoners (including, for a time, Charles Dickens himself) would pay between two and eight guineas to rent a pew. ‘Sir, After two years’ application, & a regular attendant at the Foundling for twenty years, I had some reason to expect a more desirable sitting would have been afforded me, than in pew No. 15, which I must beg leave to decline accepting’. One would have hoped the Smeaths of this world might see a little further than the ends of their noses, but human nature is what it is. Spurred on by his wife, Dr Willain ‘took [Miss Sayers] by the shoulder and tried to push her out’. The Chapel authorities later requested that Miss Sayers give up her treasured tract of oak. —–Occur – a woeful Brawl. A place unmeet for such a deed! —–That Pride and Feuds should be? Well, quite. And here seemed a perfect story for my sestude. It felt like a story Dickens himself might have chuckled, and shaken his head, over: that even here, on the site of such genuine charity, people would fall to push-and-shove over whose largesse bagsied them the best seats in the house. And as so often in Dickens, it felt like the more wretched elements of human nature served, by contrast, to highlight the best. The pettiness of Willains and Sayerses reminds us of how grateful we must be for Corams. I thought it would be fun – as well as a challenge – to write the sestude in the verse form chosen by James Sayers for his original account. Doing so, and achieving the strict word-count, was pretty tricky: many lines and verses bit the dust. But hopefully the story comes through clearly enough, in the end. The only way to end is with a huge thank-you to the Museum team for this lovely opportunity – and especially to Kathryn Wilson for providing such inspiring background on the pews. Let’s hope this project goes some way towards making more people aware of the Museum’s story, and the vital, ongoing work of the charity that still bears Coram’s name. —To see the lost baptised. —O’er one prime patch of oak. —The two sit side by side.